All-steel cabinet with follower blocks. Drawers have combination label holders and pulls. Units are stackable for increased storage. Non-mar feet won't slip. Each drawer holds up to 1,500 cards. Features label holder for identification and drawer pull for easy opening. Rubberized feet protect furniture and keep cabinet from slipping. Units interstack for increased capacity. Each drawer holds up to 1,500 cards. If you have any questions about this product by STEELMASTER, contact us by completing and submitting the form below. If you are looking for a specif part number, please include it with your message. 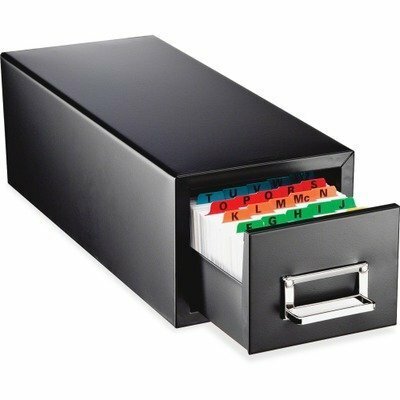 "Drawer Card Cabinet Holds 3,000 3 X 5 Cards, 12 5/16"" X 16"" X 5 3/16"""